A Kent MP has met with the new owners of the Thamesteel plant on the Isle of Sheppey today. The site was shut earlier this year with the loss of 350 jobs but recently a group from Saudi Arabia bought it. But Sittingbourne and Sheppey's Gordon Henderson says progress is being blocked by complex legal issues. Kent MP Gordon Henderson is due to meet the new owners of the Thamesteel factory on the Isle of Sheppey today. 350 people lost their jobs when the plant shut earlier this year. It's been bought by a group from Saudi Arabia. Mr Henderson wants to know how many jobs have been saved by the buyout. The Meridian Tonight item on the reopening of Thamesteel on the Isle of Sheppey. David Johns reports. The former Thamesteel plant at Sheerness on the Isle of Sheppey has been sold out of administration to a new company. The administrators say it means steel production will be able to recommence at the site "in the near future". They also say "a large number of jobs" are likely to be recreated, to replace those that were lost when the plant shut down on January 25th. Hundreds of people were made redundant at the time. The shutdown cost the local economy more than a million pounds a week; more than a fifth of the local population are employed in manufacturing. Thamesteel's administrators are due to make an announcement today on it's future. The company based in the Isle of Sheppey in Kent went into administration earlier this year with the loss of three hundred and fifty jobs. Former Workers from ThamesSteel which went into administration earlier this year are meeting MPs today. 350 employees of the plant in Sheerness lost their jobs. Some of those are heading to Westminster today to ask politicians for help. They want to find a buyer for the site who's willing to restart production and give them their jobs back . 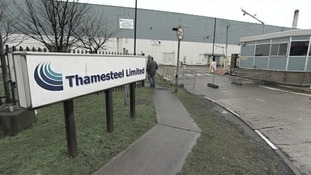 Former Thamesteel employees will ask MPs for help at Westminster today after delays to their redundancy payments. Emergency food supplies are being provided for some of the 350 steelworkers made redundant from a Thamesteel plant in Kent.